We are committed to providing customers with reliable drinking water of superior quality. Our treated drinking water consistently surpasses state and federal standards for purity. Coming from snowmelt and rain water, our drinking water has a low mineral content and is naturally soft. Without additional treatment, soft water can be corrosive to home plumbing. In 1984, eight years before the Environmental Protection Agency (EPA) required corrosion control, Fort Collins Utilities implemented a successful corrosion control program to prevent the leaching of lead and copper from water pipes. Before leaving the treatment plant, calcium is added to balance the mineral content and carbon dioxide is added to provide buffering capacity. This combination effectively minimizes corrosion of copper plumbing joined with lead-tin solder in home plumbing. Additionally, the City of Fort Collins does not have any lead service lines, though internal plumbing in homes older than the mid-1980s may contain copper pipes with lead-tin soldering. Fort Collins Utilities' water has always tested well below the federal standards for lead. Our most recent round of customer lead-copper testing was completed in 2014. None of required 50 samples exceeded the action level of 15 ppb. 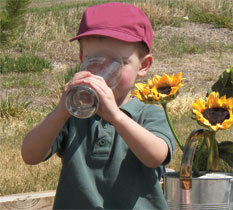 Contact the Water Quality Lab at 970-221-6863 with drinking water questions. Any concerns about home plumbing should be directed to a licensed plumber. Perform this simple test if you would like to learn more about the pipes in your home. As a reminder, property owners are responsible for water lines from the curb stop to the house, or from the property line to the house, if no curb stop exists. More information. Fort Collins Utilities is pleased to provide you with our Drinking Water Quality Report, detailing where our water comes from, what it contains and other information. Also available from the Water Quality Laboratory is the bottled water comparison (PDF 16KB). Each year, actions taken in support of the policy are reported to the City Council and Water Board. The annual reports are available for 2016, 2015 (PDF 16KB) and 2014 (24KB). Additional reports are available upon request.